Last year, when 6-0 and sky high, Lee-Davis welcomed Highland Springs to Mechanicsville, and the Springers rolled to a 42-0 victory. 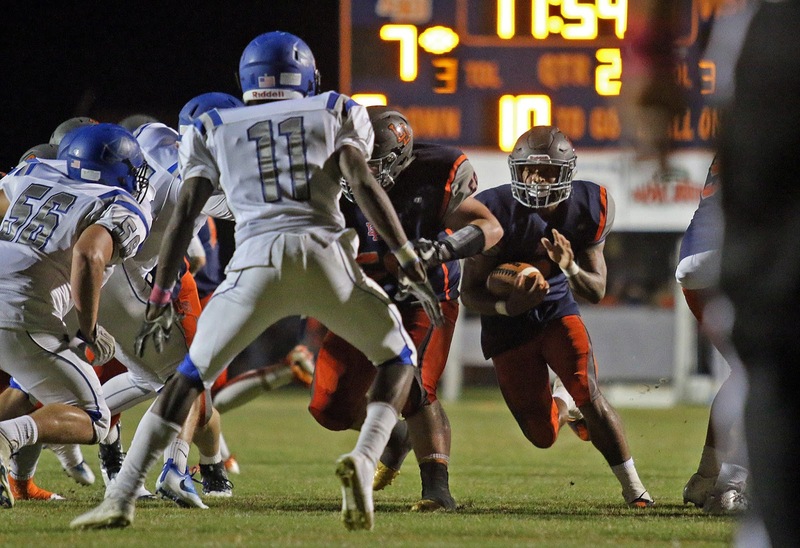 The Confederates learned from the experience, and, when finding themselves going to Kreiter Stadium for the second round of the 5A South playoffs a month later, made the rematch a heavyweight slugfest, matching the Springers score for score before falling short at 41-34. Lee-Davis quarterback Zach Lass steps on Kreiter's field for the first time, but tailback Nate Evans and most of his offensive line do not. They know what it takes to stay with the defending state champions. But Juwan Carter and his latest group of talented skill players are looking to continue their push towards the top of the 5A South Central playoff race. Look for Aaron Motley, Tavien Blackwell, and the Springer front seven on defense to decide this one. They want to stop Evans and force Lass to the passing game. Henrico wants this game, as they are in a dogfight for a top four seed, and thus, a home game in the first round of the 5A South playoffs, but Atlee needs this game. Having lost two straight, the Raiders celebrate homecoming with an air of desperation, really needing to go 3-1 in their last four games to make a run at a 5A North playoff berth. After this game, Atlee goes to Patrick Henry, then faces Varina before ending with winless Armstrong. This is the toughest of the contests, but if Atlee's defense can contain Henrico QB Jalon Jones, and if their freshman QB Tyler Warren can be more accurate in the passing game, that will force Henrico to defend the whole field, and not try to simply bottle up the Atlee running game. Turnovers will loom large here, too. A quick note for Raider fans, Reid Childers' 35 yard field goal against Lee-Davis last week was important. He can be an option with the game on the line as long as you make the red zone. Homecoming is tonight in Ashland, and the Patriots can work on a new winning streak and trying to keep themselves in the top eight in 5A North as they face the winless Wildcats. This is a game where you want to take care of business early, allow your starters to come out, avoiding injury, enjoy a running clock in the second half, and get out with a win, unscathed, so you can start to focus on the homestretch, hosting Atlee, going to Highland Springs, then hosting Lee-Davis in The 58th Tomato Bowl on November 4th. It's homecoming at Hanover, too, but it's also been a difficult season for the Hawks, who likely will miss the postseason for the first time in eleven years barring a surprising late-season run. Now, a win at home over Varina could jump start it all, and Hanover does get WR Kirk Shaffner back from injury. Shaffner was their second leading receiver in 2015, and has been on the bench all year, along with leading returning receiver Jack Chenault, due to injury. Clayton Cheatham needs more weapons, and gets one back. But will it be enough if Hanover's defense can't stop the dual threat of C.J. Jones and R.J. Coles for Varina, who is playing to keep their current playoff position in 5A South Central?